Check out our most recent news in the January Newsletter! Every year has its special moments, and 2017 will always be one of my favorite years. There were some great moments both fishing and guiding, and of course I found an amazing girl who actually goes fishing with me. That last one is what makes this past year so special to me, but some other moments stood out as well. 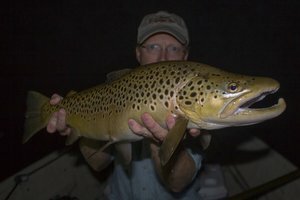 A quality brown trout started 2017 off on the right note. 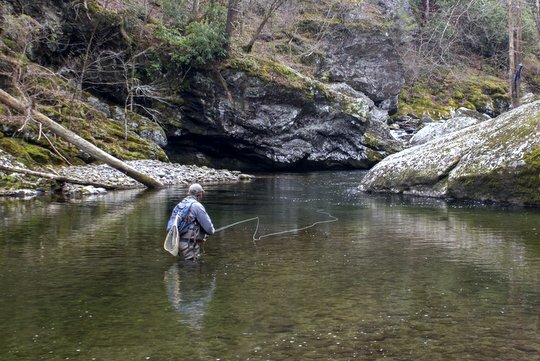 I had traveled to the Smokies for the famous "Bigsur's New Year's Day Karma Tradition" to see friends and hopefully wet a line. After saying hello to everyone, I snuck off to the stream and was lucky to be first through a good hole right near the picnic area. 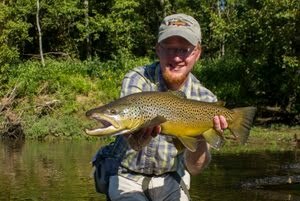 Sure enough, a nice brown trout slammed the streamer I was working against the far bank and my year was off to a great start! Fishing stayed hot through the winter months and into early spring. 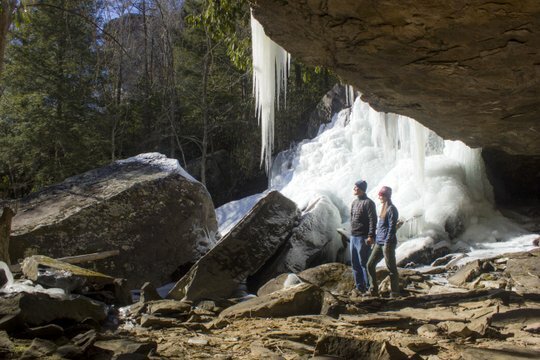 We never had any extremely cold weather so the fishing in the Smokies stayed feasible right on through the winter. The highlight for me of this winter season was catching another beautiful brown on a favorite sculpin pattern while streamer fishing. This fish was not a monster by Smokies standards, but the colors were great. And did I mention it slammed a streamer? 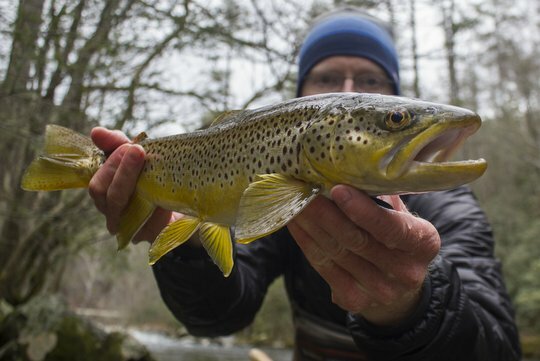 The spring hatch season started in a big way and just got better from there. The Blue Quills came off starting around February 20 or thereabouts. Fish rose every day. The problem was finding the hatch and the rising trout. On any given day, I rarely found more than 2-3 pools that were worth fishing. The hatch progressed upriver in an orderly fashion. If you found the bugs, then you also found the fish. Two early season highlights stand out for me. The first was the slightly overcast day in late February that I fished with my buddy Pat Tully. We found great numbers of Blue Quills in several pools as well as an occasional Quill Gordon or Blue-winged Olive. The sight casting possibilities were endless. Because of the overcast, the hatch lasted much longer than it normally does on sunny days. We fished dry flies for hours. 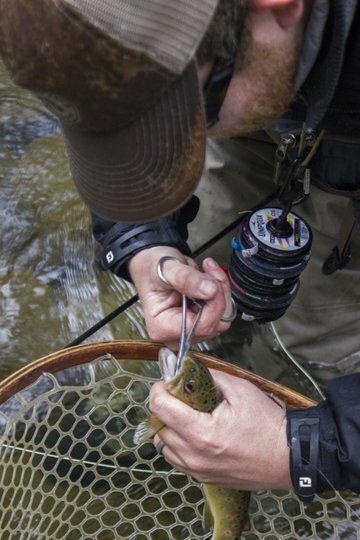 When the hatch petered out, we prospected with streamers and found another fish or two. I can't think of a better day on the water. 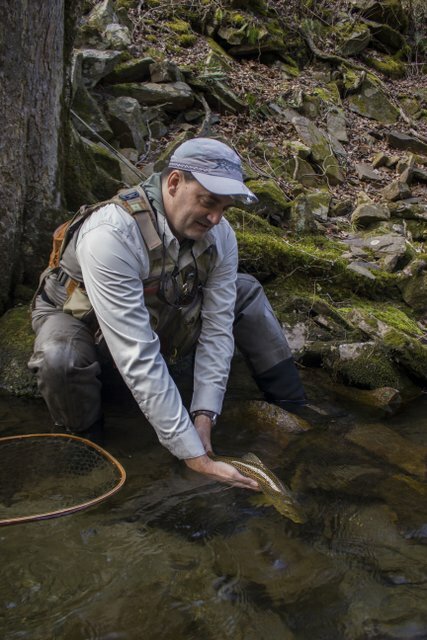 The second early season highlight was an early March guide trip that produced a large Smoky Mountain brown trout on a dry fly. Spencer had booked a day to polish some of his mountain techniques. We worked hard on nymphing throughout the day, but wanted to get in some dry fly fishing. I had a pretty good idea on where there might be some bugs. When we arrived at the pool, we found a few risers but not as many as I had hoped. The bright day probably had fewer fish rising than if it had been cloudy. Thankfully, we got lucky with one big brown at the head of the pool that liked his Parachute Adams. After the early season hatches, things went into high gear and I was too busy to fish much. However, each exception to that produced some memorable highlights. One of my favorites was when I fished with David Perry and Susan Thrasher. We had a day to remember as time spent with friends is always hard to beat. 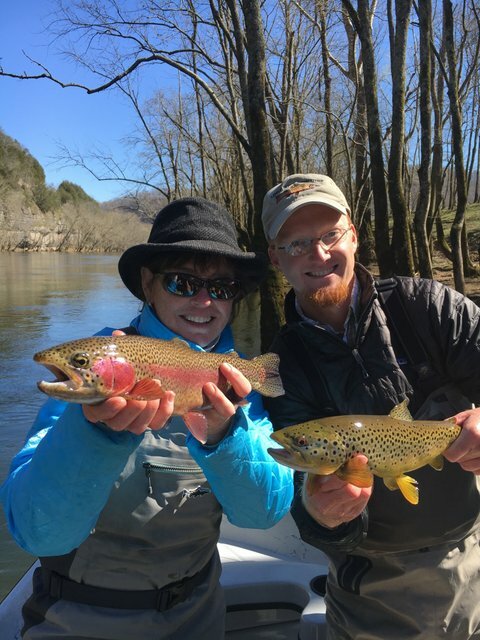 The highlight was when I doubled up with Susan on a nice rainbow and brown trout. David Perry graciously snapped a picture for us to remember the day by! Guides guiding guides was certainly one of the highlights of 2017! Early season guiding on the Caney was mostly limited to high water streamer and shad floats. These trips consistently produced some huge trout as should happen again this year. 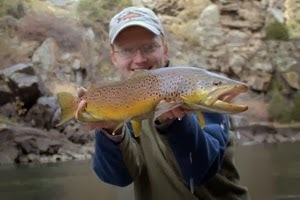 The one low water float of the early spring produced the largest guide trip fish of the year. 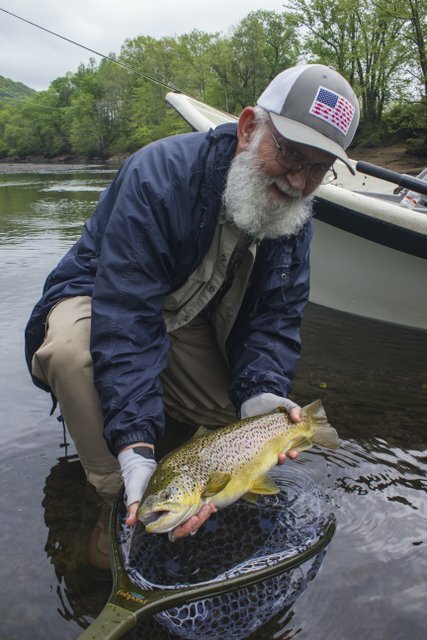 The story surrounding this big trout was particularly amazing as an old curse was defeated. Check out the link above for more on that. One of my absolute favorite trips of 2017 was in June. I actually had a few favorites in June and July, but the trip to Roan Mountain State Park to see the rhododendron and azalea was certainly one of the best. The rhododendron was as amazing as advertised, but the real highlight of this trip was the moment I realized what a special catch I had made. Leah and I had been dating for close to a couple of months at this point, but we had yet to go fishing. Leah was a good sport and agreed to fish a little on this trip up to northeast Tennessee. We hit the Doe River in Roan Mountain State Park and found a few fish before the afternoon thunderstorms drove us off the water. Right before the rain started in earnest, Leah took big fish honors by starting off her fly fishing career with a big brown trout considering the small stream we were fishing. I couldn't have been happier. I'm still not sure if she knows how big of a deal it was to catch this fish on her first ever fly fishing trip, but I'm pretty sure she has some idea based on how excited I was. 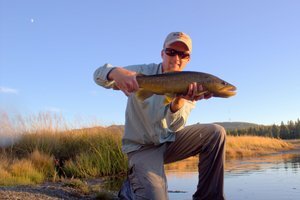 The heat of summer often produces some of the best fishing of the year if you know where to go. This past year was no different. 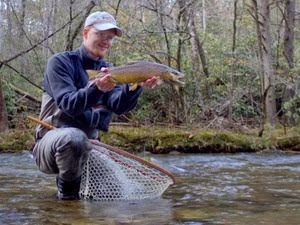 Guide trips produced some big trout on the Caney Fork and gorgeous brook trout in the Great Smoky Mountains. 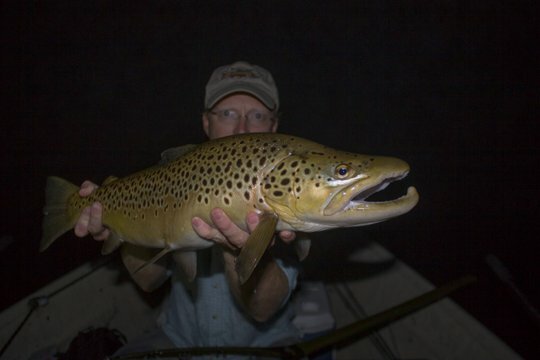 Smallmouth fishing had hit a consistent stride and night time trout trips on the tailwaters were heating up. 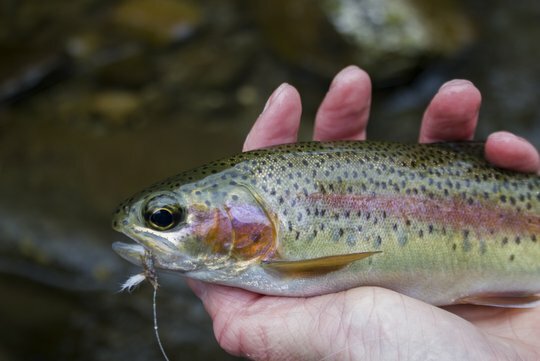 My favorite fishing in June, July, and August is usually the beetle fishing in the Smokies and on the Caney Fork River. This year was no different. My most memorable Smokies fishing of the summer involved an afternoon off after a morning 1/2 day guide trip. After dropping off my clients, I headed back to the Park to get in a couple of hours of fishing. In that time, I caught three trout. Two of them were sight fished with the beetle while the third also ate the beetle as I blind fished it in likely places. The pinnacle of the whole year in terms of my own fishing and catching happened in late July. My buddy and fly tier extraordinaire Brandon Bailes and I had discussed a nighttime mousing trip on the Caney Fork. We finally got our schedules together and set off for an evening of fun and hopefully large trout. 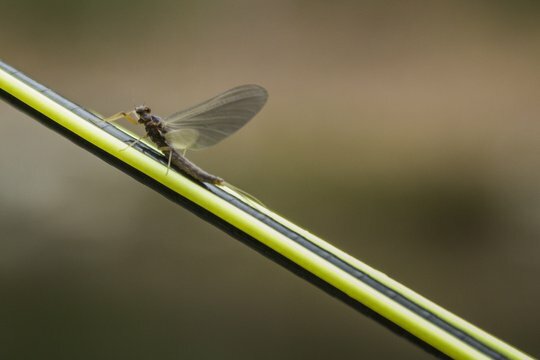 We launched with some daylight left and spent our time alternating between nymphs/midges, streamers, and some dry flies when we found late evening sippers in slack water. We were almost halfway through the float when it got dark enough to begin the main event. Heavy rods, stout leaders, and meaty rodent imitations were tied on and we kept floating into the growing darkness. Throughout the next couple of hours, we had two big blowups but failed to connect. Each heart stopping moment served as motivation to keep slinging the meat. Finally, we were approaching the takeout ramp and it looked like the mousing portion of the evening would be just enough to wet our appetites and not much more. There were lots more guide trip highlights throughout the second half of 2017. However, my fishing began to slow down somewhat. The exception to this also produced the last two highlights of the year for me. The first was in late August. I had been discussing a smallmouth bass excursion for a while with Daniel Drake of Little River Outfitters and Mark Brown of Chota. We finally nailed down a day that would work for all of us. The day came and went much to fast, but I was left with some great memories of time spent on the water with friends. The interesting part of this fishing trip is that we didn't get any monster smallmouth. 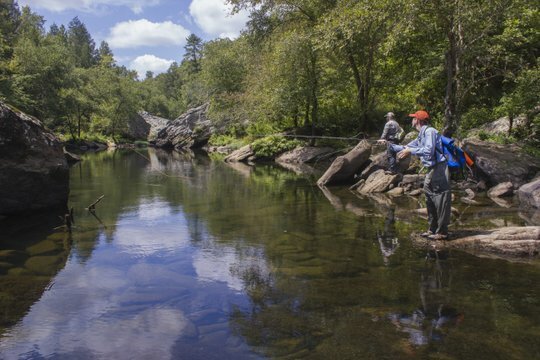 Most of the time, these Cumberland Plateau streams are good for at least one big smallie per day, but it was not meant to be on this particularly trip. Nevertheless, we found plenty of willing fish and had a great day of exploring with friends. The last highlight of the year for me happened on a day of fishing with friends. 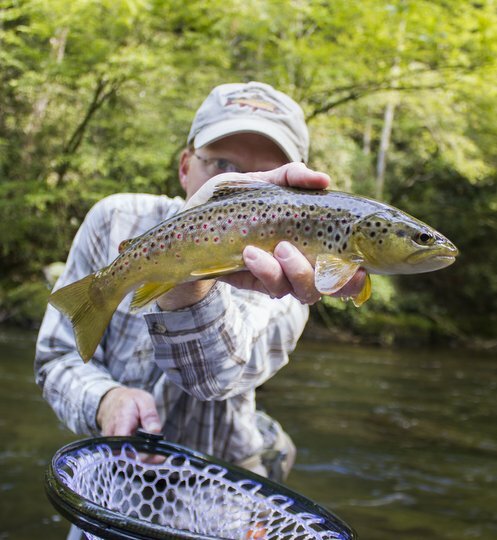 I began the year with a nice brown trout in the Smokies, and I ended the year with a nice brown trout in the Smokies. Talk about the perfect way to begin and end the year! Now, while not fishing related, the best and most exciting highlight of the year happened on November 25, 2017. On that day, I asked my best friend to marry me and she said yes!!! Leah Shulley is an amazing young lady who loves the outdoors almost as much as I do. She is beautiful, smart, kind, thoughtful, loves adventure, and most importantly loves God. I'm super excited about sharing life with her!